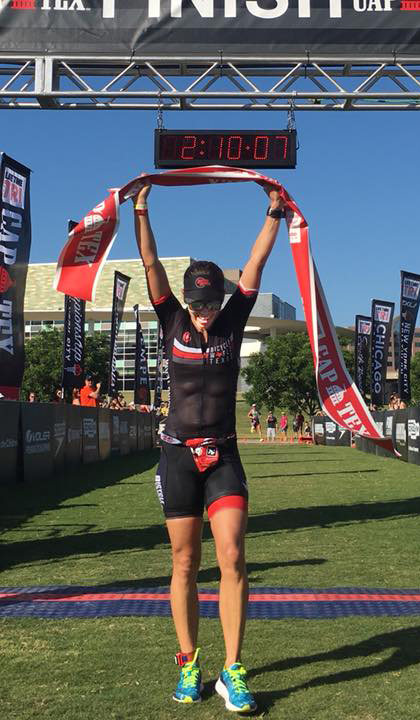 Natasha Van Der Merwe likes the saying, “Greatness is a Result of Perseverance.” It’s fitting then, that she stood atop the podium in first place last week after racing the Life Time Tri CapTex eight times over the years—including placing second once and third twice. Exercise physiologists say that it takes 10 years of training before an endurance athlete reaches his or her potential, and Van Der Merwe, who turns 37 this week, is a classic example of how long-term endurance training pays off. Triathlete Natasha Van Der Merwe, who turns 37 this week, is a classic example of how long-term endurance training pays off. A tennis pro in her native South Africa, Van Der Merwe didn’t start triathlon training and racing until 2008. She excelled quickly and got her pro triathlete license in 2009. In 2014, she nailed a world-class 9:29 finish at the Ironman Florida—her personal best for that distance, and placed in the top nine in every race she did as a pro that year. But Van Der Merwe’s role in sports doesn’t end as a competitor. She started coaching in 2011, first for a few friends, then for a triathlon coaching company called TriDot. “I became the Director of Triathlon at Austin Aquatics at the beginning of 2016 through the end of 2017, running the triathlon program and coaching athletes in person at their training center,” said Van Der Merwe, who is also a new mom (her daughter, Nadine, is now 19 months old). Let’s take a look at how focused she can be. Headed into last week’s Life Time Tri CapTex, Van Der Merwe’s goal was to go all out from the gun and try to hold on. Van Der Merwe was second through transition and then took the lead within the first mile of the bike. Many a triathlon has been lost on the run leg, but Van Der Merwe wasn’t about to let that happen this time around. “I luckily got off the bike and actually felt really great so I just continued my strategy of pressing the pace throughout holding 6:20-30 pace throughout the 10K,” she said. And let’s not forget about the heat—it was a scorcher Memorial Day morning, with temperatures climbing into them 90s. Van Der Merwe had raced a 70.3 Ironman event just a week prior that was also in the high 80’s on race day. “So, knowing I just had to run 10K in the heat made it very manageable mentally and physically. I made sure to take three or four cups of water each aid station and grab ice whenever they had it,” she said. Van Der Merwe kept her lead throughout the run, running just over 40 min which was the fastest female run time of the day, and finished ahead of second place Chelsea Tiner of Dallas (2:12:21) by almost four minutes, clocking a 2:08:52 for the International Distance. As she reflects on her success, Van Der Merwe fully realizes that it took years of training to achieve. Upcoming races: Thursday, June 7, at 8:00 p.m., Maudie’s Moonlight Margarita Run 5K at Seaholm Power Plant, 800 W. Cesar Chavez, Austin. Saturday, June 16, Dos Rios 5K Splash and Dash at 8:00 a.m. at Cypress Bend Park, Peave Ave. in New Braunfels. Saturday, June 16, Lake Pflugerville Triathlon at 7:00 a.m. at Lake Pflugerville. Next Post What is Running Economy, and How Do You Improve it?